June | 2014 | Franchising You. TWO MEN AND A TRUCK® definitely knows a thing or two about moving. Just ask the five million customers we’ve moved. The company completed its five millionth move yesterday, an amazing accomplishment for the company which began with two Michigan high school boys hauling trash in their 1966 Ford truck. In fact, our four millionth move was completed only two-and-a-half years ago. Given our 25 years in business, who would have thought the five millionth would happen so quickly? The five millionth move, sponsored by TSO Mobile, was completed by multi-unit Franchisee Steve Ziara’s Spring, Texas, location. 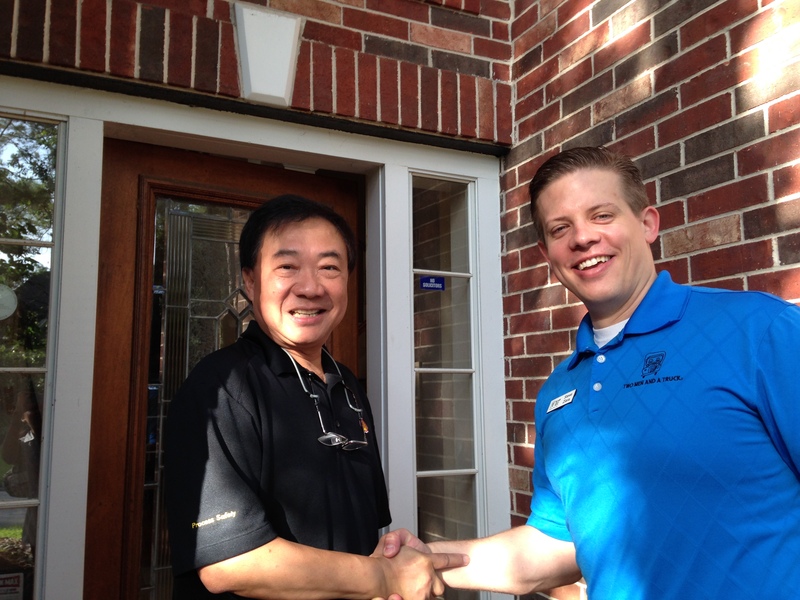 TSO Mobile’s sponsorship included underwriting the cost of the move and a neighborhood breakfast send off for the customers, Hung and Lee Tornthat. Kicking off the move, Ziara presented the Tornthats with a video message from the original stickmen — CEO Brig Sorber and Executive Vice President Jon Sorber. 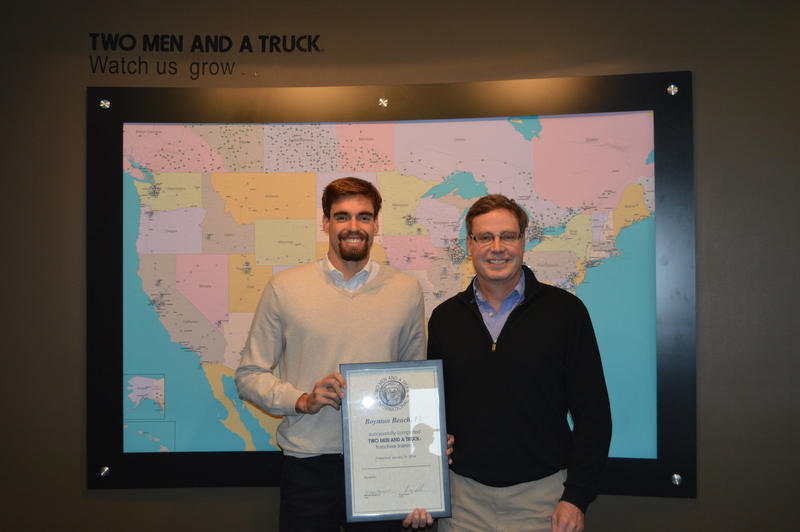 Brig and Jon thanked the couple for being TWO MEN AND A TRUCK®’s five millionth move and contributing to our company’s history. Following the heartfelt video message, the Tornthats enjoyed the sendoff breakfast which gave them the chance to not only celebrate the milestone, but allowed them to say goodbye to their neighbors. Ziara could not have been more ecstatic for his location to be a part of such a momentous occasion within the company. On behalf of all the TWO MEN AND A TRUCK® system team members, we want to send out a huge thank you to each and every one of our customers. It is because of all of you we were able to reach this momentous milestone. We want to thank you for placing your trust in TWO MEN AND A TRUCK® and for allowing us to continuously exceed your expectations. 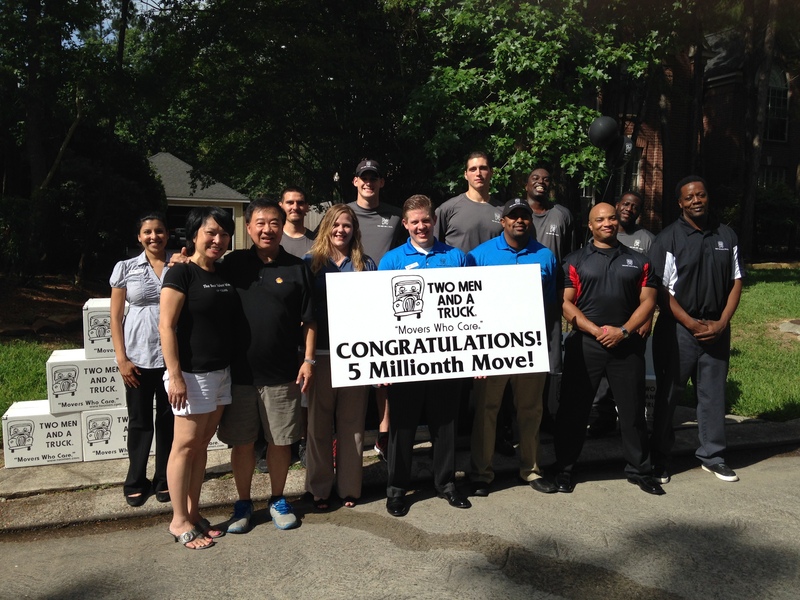 Thank you for being a part of our history and for sharing this five millionth move with us. Be on the lookout for our six millionth move. Who knows? It may be just around the corner. Q: Why did you decide to franchise with TWO MEN AND A TRUCK®? David: For the last 14 years, Eric has had a fascination with moving, and he decided he wanted a career in that industry. We realized that a franchise business has a much greater chance of success than a non-franchise business, so we investigated moving franchises. In doing so, it quickly became apparent TWO MEN AND A TRUCK® was not only the largest entity in the vertical but also the most successful. Since neither of us knew anything about moving, we felt we needed all the help we could get, and we now feel like we got it. Q: How has this experience been for you as father/son team? David: Creating a father-son-owned business was actually a natural extension of our relationship. I used to coach Eric’s PAL basketball team, and I was very involved in his competitive swimming. We are used to working together in a competitive environment; we know each other’s strength and weaknesses. Our past experiences also confirmed to me Eric was the right choice for a partner. When things get difficult, he somehow remarkably finds a reserve of energy to get the job done. He is scary competitive, so I am glad he is on our team. It has been a delight to now work with him as an adult, although somewhat strange. I have to remind myself he is an adult and business partner and refrain from making parent-like statements. Q: What were some challenges you’ve experienced and how were they overcome? David: My initial challenge came early. With zoning restrictions and limited parking, I had difficulty finding a suitable location for our franchise. To overcome this challenge, I first became very familiar with the zoning map in our area. I was also very organized in our search for property and, most importantly, very persistent. I was tempted to settle on a less-desirable location but pressed forward and eventually found what I think is an ideal location. I found it helpful to reach out to city officials and let them know what I was seeking. They were helpful in directing me in the right direction, as they want us to be successful, too. I have also had challenges with authorities, trucks, and employees. These have all required different solutions, but usually I have relied on input from our field trainer and development specialists, and I have leaned particularly frequently on Corporate Trainer Melanie Zaremba. She has always been helpful and thinks of solutions that initially eluded me. Q: What do you like about owning a TWO MEN AND A TRUCK® franchise thus far? David: I like the feeling of being part of a larger team. I enjoy all of the different personalities from home office and the different strengths that accompany them. I also like the idea of building something from the ground up. I get a real sense of accomplishment as I look across the office and see employees answering phones and hear the trucks rumbling out of the lot to jobs. Four months ago our space was empty and dark, and now it has sprung life. It has become a source of pride and hope not only for Eric and me but also for all of the employees. Q: Can you talk a little bit about your fast growth? What tools have you used in the system to help make this happen? David: We have been blessed with rapid growth. We initiated a grassroots advertising plan and have benefited from it. However, both the online paid search advertising and direct mail postcards provide a very easy and effective means of advertising. We simply decide on how much we want to spend on these forms of advertising, and it is set on auto pilot, freeing us up to tackle other tasks. Dovetailing with this is our very effective website, which just miraculous appeared when we opened. With this rapid growth we have had some growing pains. We have needed to hire more employees than I anticipated. The hiring software has been helpful in our employee search. Q: What do you believe your future looks like? David: I envision continued growth. We are joining marketing efforts with Joel Dowley and his Florida locations to embark on a television campaign starting this fall. In this area, there is still a large market share to be had, and expanding the TWO MEN AND A TRUCK® brand should wrestle some business away from our less professional competitors. Once we have this franchise under control, we also would consider opening a second. Having already been through the startup process and experienced many lessons on the journey, a second franchise should be easier.